Nima Sangey, VP, NPP Arunachal Pradesh got the berth in the four members National Sub-Committee for Arunachal Pradesh. 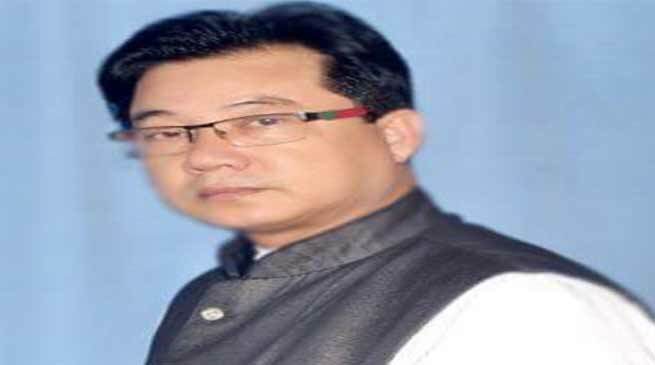 The National President of National People’s Party (NPP), and the Meghaaya CM, Conrad K Sangma has constituted National Coordination Committee headed by Deputy Chief Minister of Manipur & National Vice President Joykumar Singh and National Sub-Committee to oversee party strengthening, image in public domain with media intervention and enrolment drive including other promotional and development activities in the State of Arunachal Pradesh and Mizoram. Gicho Kabak State President NPP, Arunachal Pradesh highly appreciated National President Conrad K Sangma for constituted the National Coordination Committee for Arunachal Pradesh and Manipur under the Chairmanship of Joy Kumar Singh, and hope that this committee will work for the greater interest of NPP in Arunachal Pradesh and Manipur for strengthening the party organisation in two states. Gicho Kabak also congratulates Thomas A. Sangma, Snaiwbhalang Dhar, and Marcuise Marak, and Nima Sangey, for being appointed as member of national sub-committee for Arunachal Pradesh.